To add pages to your website, first choose the most appropriate section to add them to. Website sections correspond to the routing rules set up in "Structure" section in Site app. URL. The URL part following the domain name in section address will also be contained in the URLs of all its pages. In the above example, pages published in the website section provided by Site app will have URLs starting with /info/. If you publish them in the website section provided by the Shop app, then they will not have an extra fragment at the beginning of the URL. Choose the type of URL which you think will be most convenient to your visitors. Design. Every website section is provided by one of the apps installed in your Webasyst, and each of those apps uses its own design theme. Being very similar to each other, those themes may still have some different elements such as extra menus, banners, search fields, etc. Choose the section for adding new pages where they will appear most logically and will be most easily accessible. Availability of page publishing option. Not all apps whose names you can see in the "Structure" section will allow you to create pages. For example, entries added for Mailer and Contacts apps, which are usually marked as hidden, are used for special communication between some website elements and those apps and do not add their own sections to a website. Choose one of the apps offering page publishing; e.g., Site, Blog, Hub, Photos, Helpdesk. There is also an option to add pages using the design of one section with the URLs matching that of a different section. In the above example, you can create new pages using the Shop app, with a URL being simply /, and add the info/ part to their URLs. You may do so if you want to avoid conflict between online store's built-in URLs such as cart/ or checkout/ and those of your custom pages. Open the app for which you want to add new pages and find "Pages" section. In Shop-Script app you will find "Pages" link in "Storefront" section. Enter page name, URL, and text. The page name is by default used in page menus on the website, if you did not make changes to your design theme. If the visual text editor does not provide you enough editing options, switch to the "HTML" mode to apply custom markup and styles. Use the "more" link to view more fields for adding extra page parameters, which are mainly used for SEO purposes and for editing design themes. Switch the publication mode to "Draft" and save your changes. 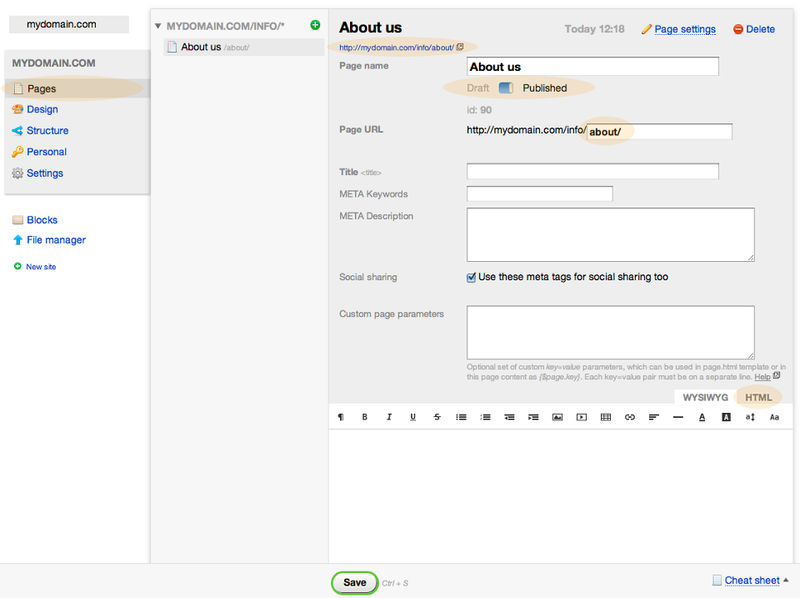 Use the preview link to see how your page appears on the website when published. Once you are satisfied with the result, switch the publication mode to "Published".